The doctors said she was barren, because she had tried since they got married at 16 years old. By the time she hit 40 years old, they gave up. When she turned 50 years old, they were looking into adoption. They adopted when she was 52 years old. 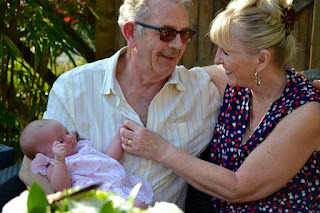 But at 53 years old, she got pregnant naturally (she didn't know until she was 6-7 months along - thought it was menopause), and she had him when she was 54 years old. He is 37, almost 38 years old, and she is now 93 years old! Both parents are still alive and living well and healthy and enjoy all there grandchildren now. -- Pregnancy books on the market have one of two audiences - the teen with an unplanned pregnancy or the adult with a planned and chosen one. Nowhere is there a book for the almost 3 million adult women facing surprise pregnancy every year. Surprise Motherhood is aimed directly at that gap, telling the stories of Ophelia and other women who have faced unplanned pregnancy as adult, professional women. With extensive information about options, paternity, career issues, postpartum depression, finances, and more, Surprise Motherhood is the only reference of its kind, and is sure to be an invaluable reader resource. Start reading Surprise Motherhood on your Kindle in under a minute! This is like magic. Do doctors have explanation why she didn't get pregnant earlier and all of the sudden now she gets pregnant at that age.? Yes it is magic, i know, I am 53 and i am expecting a natural conceived, baby in june. Just too add i was not menopausal either. I do have 3 other children as well. Must say i have raised a few eyebrows including, the medical profession. Debbie how is it going? congrats!!!!!!! Congratulations. Doctors are not always right and many women have had babies in their 50's and I am sure still do. Hope they post a comment on this as I am tired of hearing just bad things about older women having babies. Stop keep writing us older women off. Well done Debbie. Keep posting to let us know how it is going. I haven't seen my period since June and it is now August. I thought this is just down to the menopause, but after finding this site, I might just be wrong! I have been feeling strange, but again put this down to a change in my hormones. It would be really exciting to have another child. My 2 children are now grown. I have been with a man 3 years now and love to have his child. There is hope! I will be going to the pharmacy as soon as possible to buy a home pregnancy kit! Thank you so much for this website. It brings hope to those of us who could only dream before. Thank you, thank you so much. I've felt very much alone being pregnant and 50. I have conceived naturally and my girlfriends are thrilled. I don't want to go to a western Doctor because they are so unsympathetic. I intend to see a Traditional Chinese Medical practitioner. Who happens to be a qualified surgeon from China, and has world recognised awards. My female relatives lived active lives well into their 90's. 50 and pregnant and terrified. I have been told all my life I can't conceive without fertility treatment, but this will be my fourth natural pregnancy. Two miscarriages, a beautiful baby boy who died in an accident at 15 months old in 2000 and now pregnant again - at 50! Now come all the horrible statistics. A 1 in 5 chance of Down's syndrome, though my optimistic mind turned that around to 4 out of 5 not born with Downs. I have to wonder about conventional doctors and how they love to stick us all in boxes of statistics - I really hate being put in a box! And it also occurred to me today that if I had walked into my docs office, told them I have fertility problems, have just turned 50 and decided I wanted to get pregnant again, I would likely have been given a referral to a psychiatrist! Just making the point that in mainstream medicine thinking, getting pregnant would be put of the question, yet here I am! Having an ultrasound tomorrow and I'm keeping everything crossed!